1) BEACH BALL KUDOS – This is a very powerful activity that helps team members understand how important they are to each other. Have everyone get in a circle. Take a beach ball and as the leader start this activity by throwing the ball to someone in the circle and say something positive to them, about them. EXAMPLE: George I am throwing you the ball because you are always smiling, George then takes the ball and throws to someone else. Go around the room until everyone has had something kind said about them. TIP: I would be clear with participants that the purpose of this activity is to set a nice and positive atmosphere for our group and that we need everyone’s participation to say kind things. 1) THAT THING CALLED UNITY – Read Aloud: page 21-24. THUMBS UP OR DOWN – We are going to go through this list again. With your partner discuss whether you are currently a thumbs up or down on each quality. With peace that binds us. 2) GOSSIP AND OTHER NEGATIVE TALK. Read Aloud: 24-26. 3) FORGIVENESS AND UNITY – Read Aloud: page 26-28. ACTIVITY: LET IT GO – Have you ever had a hurt you felt you couldn’t forgive? Write down your hurt on a slip of paper. Place it inside a balloon and then blow up the balloon. As you place your hurt in God’s hands (not your own), throw the balloon in the air and let it fall to the ground. Walk away knowing that God will handle it and you no longer need to carry that burden. Ask participants to get in a circle and then pray as a group for forgiveness and peace. SUPPLIES NEEDED: Balloons, slips of paper, and pens. We will join together for an interactive and unifying time of prayer. Everyone will get in a large circle. One member will share with the group a prayer request that they have and will take a roll of twine, wrap the end of the twine around their hand and toss it to another member. Everyone will share a prayer request while building a “web-like community” in the process. WRAPPING IT UP – Once everyone is wrapped in the web you as the leader will begin to facilitate the activity. Have everyone take one step FORWARD and watch the web collapse – talk about how without prayer we have no support. Have everyone take one-step BACK and watch the web tighten – talk about how when we all pray we have the support of the entire group. Have one member GENTLY TUG the string then ask what other students felt the tug – talk about how we can all feel the prayers of others. Conclude this activity by having everyone pray for each other. HOMEWORK – Read Chapter Three. 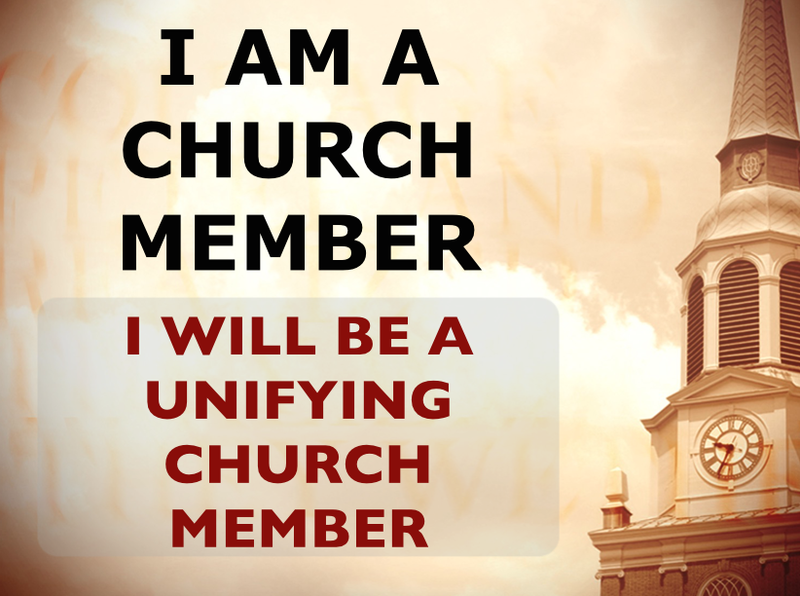 Sign and date the second “I am a church member” pledge after consecrated prayer to the Lord. Posted on August 31, 2015, in I Am A Church Member - Series, Ministry Monday and tagged preaching, preaching series, small groups. Bookmark the permalink. 1 Comment.